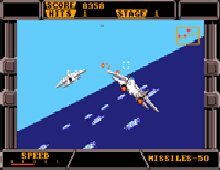 Hokay, for those of you who haven't seen it in the arcades and missed the Megapreview a couple of issues ago, Afterburner goes like this: launch your F-14 Tomcat from the flight deck of an aircraft carrier, zoom along at Mach 96 and shoot the marauding hordes of Russi... sorry, enemy aircraft who scoot around taking pot-shots at you, stopping for refuelling occasionally. Nothing frighteningly original there, I know, but where Afterburner excels is in the graphics. Even on the Speccy conversion, the speed at which sprites are wanged around the screen is phenomenal, especially considering that as your F-14 banks, the ground and all the clobber littered about on it bank too, so all the sprites have to be rotated around. The mathematics behind it doesn't bear thinking about. But then what maths does? As you can probably imagine, colour pretty well goes out of the window once again, making me wonder where the Spectrum got its name. Well fast it may be. So fast that you'll often be wiped out without knowing what's hit you. The trouble is, though, that there's very little to do. Your guns fire automatically, missiles lock on as soon as your sights pass over the target, so all you have to do really is dodge enemy fire and launch the odd missile now and then. Overall, a fun game, if a little too easy and repetitive.